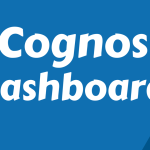 Cognos is a Business Intelligence (BI) solution created to encounter the challenges of enterprise-scale reporting, analyzing, scorecarding, and event notifying. Generally data is extracted from various sources and transformed into accurate and precise information and stored in a Data warehouse. Cognos BI solution helps interpret monitor and administer the business performance including business reporting, business analysis, turnover measurement, financial planning, prediction optimization and cost management. It is a fast and competent technique which delivers multidimensional BI data. Constructing a data Warehouse and a fully well executing information Management system in a company is challenging both for the business and technical experts. To deliver the important information to business and perform proficiently, understand the end-user requirements and co-operating closely with the business is recommended before implementing cognos solution. The Cognos BI Architecture has a multitier architecture. Servers are usually grouped to accomplish certain functions within a distributed set up. These functions of servers define the tier within the architecture that a Cognos server uses. These are typically based on the business roles and are segregated by network firewalls. Web tier allows user associations to Cognos BI applications, and the element which performs this role is IBM Cognos Gateway. It manages the web interaction for the IBM Cognos platform. High scalability requisites can be fulfilled with multiple redundant gateways set up along with an external HTTP load-balancing router. Web interaction in Cognos is distinctively through the gateways, which stay on one or many servers. A gateway is an extension of a web server program which transfers the information from the web server to another server.Web interaction also occurs directly with BI Dispatcher, though this happen seldom using gateways. If a gateway component is installed on a different computer from Content Manager or Application Tier components, gateway computer must be configured so that it would identify the location of a dispatcher, preferably one on an Application Tier component computer. For failover security, more than one dispatcher for a gateway computer should be configured. 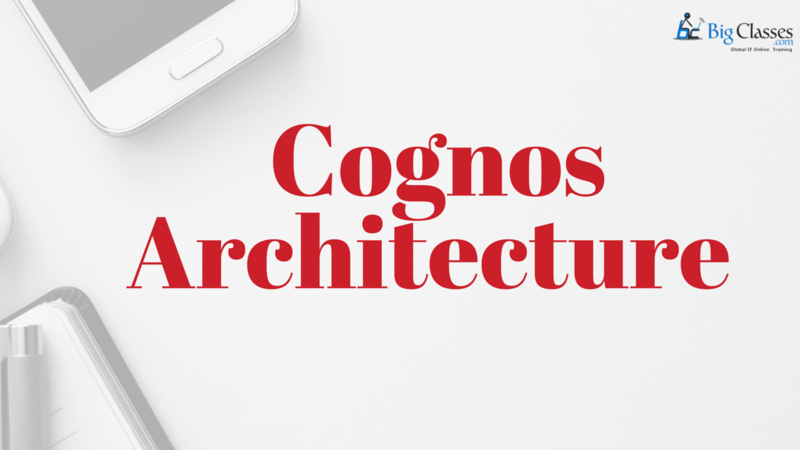 I encourage you to see this Cognos Architecture video tutorial that clarifies what is Cognos Architecture and all that we have talked about in the blog. Proceed, appreciate the video and reveal to me what you think. This includes one or more Cognos BI servers. A Cognos BI server carries out requests like reports, analysis, and inquiries forwarded by a gateway. A Cognos server provides Cognos connection interface too. 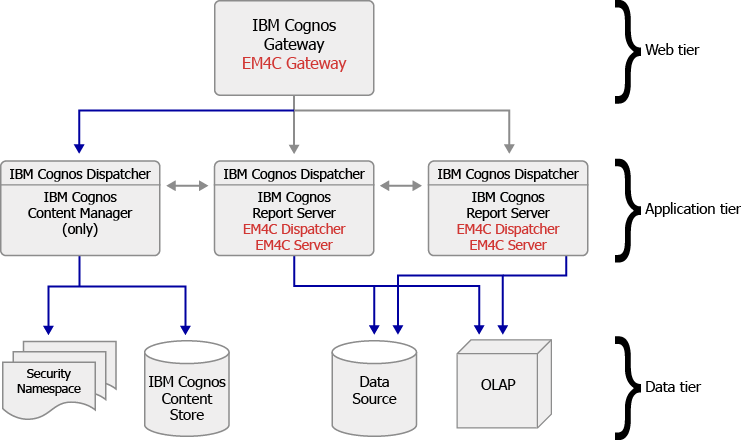 The IBM Cognos Dispatcher starts all the IBM Cognos Services configured and set up on a computer and directs the requests. It can direct requests to a local service, like report service, presentation service, job service, or monitor service. It also can direct requests to a particular dispatcher to carry out a given request. Requests can be directed to a particular dispatcher on the basis of load-balancing requirements, or package or user group needs. When an IBM Cognos BI gateways is configured, universal identifiers (URIs) of target dispatchers can be listed in the sequence of most to least preferred. If it fails, requests are directed to the other dispatcher on the basis of the list. When a dispatcher begins, it registers itself with the Content Manager. As a result, every dispatcher is known to the other dispatchers. In case, of a dispatcher’s failure or unavailability, requests for the same are directed to the next dispatcher available till the dispatcher registers itself again. After installing IBM Cognos BI, and configuring it, one dispatcher is available on every computer by default. Every dispatcher has a suite of associated services. IBM Cognos Dispatcher begins IBM Cognos Reporting Server’s processes vigorously as required to manage the request load. An entire list of services present in IBM Cognos Reporting Server is very vast. The below services are eminent as they have a direct influence on installation and configuration of Esri Maps for IBM Cognos. 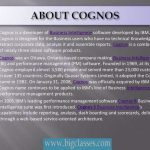 It offers display, navigation and abilities of administration in Connection to IBM Cognos. It handles interactive requests to carry out the reports and gives the output for a user in IBM Cognos Connection or studio. IBM Cognos Content Manager is a platform for IBM Cognos service which manages (amongst various things) storage for the below mentioned information of application. Configurations and Security settings, server configuration settings, packages, report specifications, and report output. IBM Cognos Content Manager maintains the information in a relational database known as a content store database. At least one IBM Cognos Content Manager is needed for every IBM Cognos Platform implementation. Content store—is a relational database comprising data the IBM Cognos BI product required to operate, like report details, published models and the packages containing the same, data sources connection information, external namespace information, and the Cognos namespace and scheduling and bursting reports information. Data sources— Data sources accessed through IBM Cognos BI are relational databases, dimensional databases or OLAP cubes, flat files, and the other physical data stores. They include the connection information required for accessing the data too.